Security Strategy is one of the fundamental documents forming the framework for setting security interests and developing capabilities to ensure security of a state. Nevertheless, the current security strategy of Slovakia has been in place for 12 years and is in desperate need of revision. 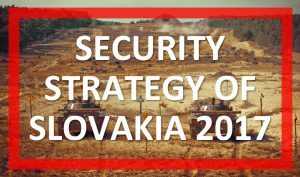 This paper aims to aid the lengthy and challenging process of adopting a new security strategy by analysing the draft of the Security Strategy of Slovak Republic 2017 drawing attention to possible shortcomings that could be incorporated into the final version. The Czech Republic and Poland both adopted their new security strategies recently, in 2015 and 2014 respectively. These countries also share similarities in the security environment to Slovakia. That is why they were chosen for comparison with the current draft of the Slovak Security Strategy. We compare formal aspects, security interests, security environment and security policies to provide policy-makers with a broader overview of the status of similar documents abroad to highlight and shortcomings the new Slovak document may contain. It would be worth considering adjusting the part devoted to background in the fashion of Czech and Polish security strategies. This would improve orientation throughout the document and make it more transparent. The strategy would benefit from a hierarchy of interests that would lead to clear prioritization in these areas. Absence of prioritization is also clear regarding policies. This element is especially important because: (1) Means at our disposal will always be limited. It is essential to have a clear idea which interests are the most important and which can be waived. (2) Situations may arise when the individual interests are incompatible and we will have to decide to pursue one in the expense of others. The same logic applies to threats. The document suffers from lack of structure. It is particularly evident in the parts devoted to the security environment, but it is visible across the whole strategy. Structure of the Security Strategy of Poland should serve as an inspiration. There is a lack of position on the Common Security and Defence Policy of the EU and the EU’s internal security strategy. The position should be added to make to role of Slovakia understandable for all relevant actors. After incorporating these recommendations, the final version of the document should meet the purpose it is intended to serve and thus create an effective framework for setting up and enforcing security interests and developing capabilities to ensure the security of Slovak Republic.